You are currently browsing the category archive for the ‘short row’ category. Oh Sahara. 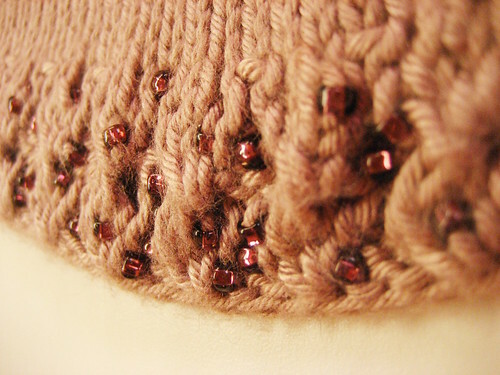 The diamond rib stitch pattern is gorgeous. And I’m soooo glad I added beads. They were a bit of a PITA to thread on and knit with, but they really made a huge difference. And I love how this required practically no seaming what so ever (only needed it to seam up the center panel). Top down knits are the bomb!! The only thing I would go back and change about this is I accidentally knit the hem in the wrong size needles. It doesn’t look bad, but I noticed that it puckers a bit when I wear it, so I may eventually go back and rip that out and reknit on US4’s. The good news is that I won’t run out of yarn! I love how the sleeves are constructed with short rows, and how you can adjust how deep you want the neckline by how far up you seam up the center panel (had to seam mine up a bit far – didn’t want the ladies poking out too much!!). 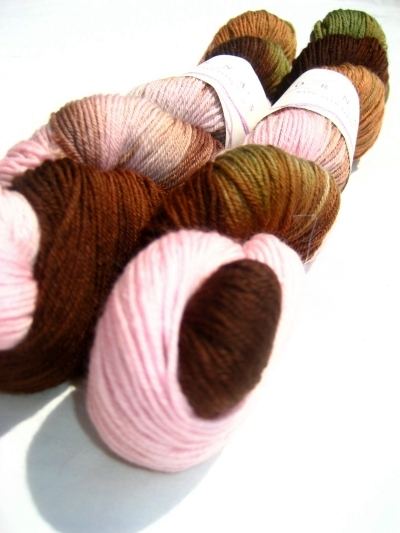 I will say that I’m a bit worried with how much the Ella Rae Bamboo Silk will stretch. I think a little more length will be fine, but I can see how it would want to stretch a bit more, so we’ll see with wear. I was also worried about the color, but think it turned out fantastic, especially with the beads – without them the color would have definitely washed me out. All around a fabulous knit. 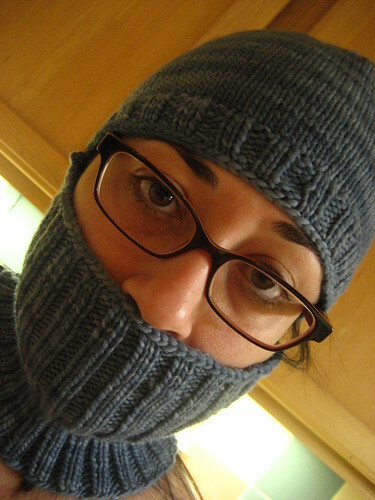 I also knit up aHelmet Liner for my dad’s Christmas gift while on a business trip. Its a quick knit and I think he’ll love it!! Finally got some decent pictures with Salina, and just in time too! Its about to get HOT here in Dallas! 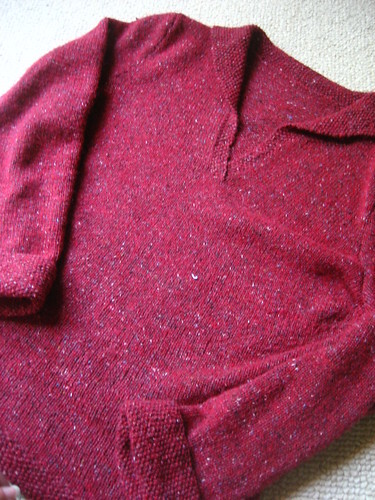 My first pullover, my first seamed sweater, and my first experience with Felted Tweed. I love how it turned out! Inadvertently I cast on using the larger size needle, so the hip isn’t really fitted, which may be an issue later but only time will tell. 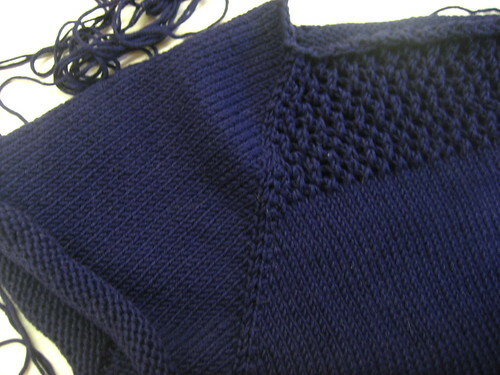 I also added a total of 12 short rows to the bust, which made a HUGE difference I think – it fits perfectly there. 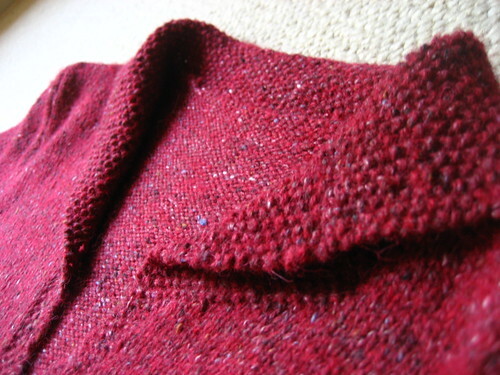 Instead of knitting the cuffs separately I picked up around the edge of the sleeve and just knit them in the round. Mostly because I was lazy, but also because I wasn’t sure whether the cuffs flopped around, and I didn’t want to find out. 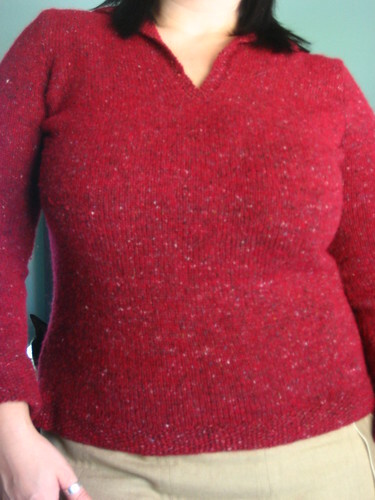 The only issue I see with this knit is where it bunches around the underarms. I’ll have to see how to alter for this problem with my later projects. Have you ever been so anxious to finish a project that you hunkered down for an entire day adding the finishing touches? I have. With this sweater. See, I live in an area where cold weather doesn’t usually last past April, and I knew I only had a few days left before it was hotter than Hades here. So I went to my LYS on a Saturday, and spent the entire day, and I mean the ENTIRE DAY from noon until 5 knitting those cuffs on size 1 needles. 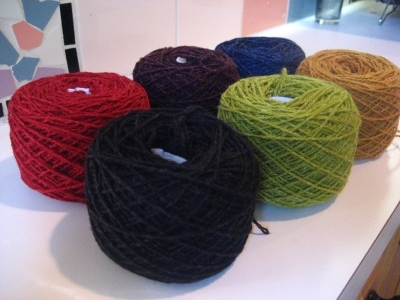 I didn’t eat, drink, or stop but a few times to fondle yarns. 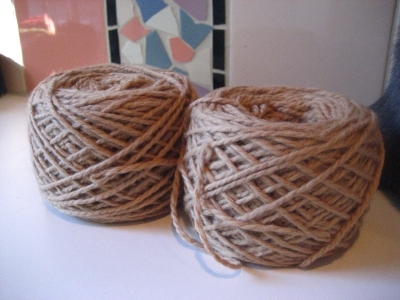 I even pulled some yarn for my next project and stared at it while I knit those cuffs. I was friggin’ determined to wear my new sweater out that night, and damn skippy I did. I was able to wear it twice before it was too warm (come on cold front!!). I may be able to take it with me to Minneapolis next week, or to Northern California the week after, if its chilly enough! I thought for sure I’d be sick of knitting red after Salina, so instead of using the JaggerSpun Zephyr Silk Wool I originally purchased for the Auburn Camp Shirt, I picked up some Classic Elite Silky Alpaca in a beautiful blue. But alas I was not happy with the fabric I got after knitting a swatch on 1’s, and I was NOT going down to 0’s, so Zepphyr it is, in wine. I cast on earlier tonight but there is nothing to see yet so no pics! Pattern: Monkey by Cookie A. 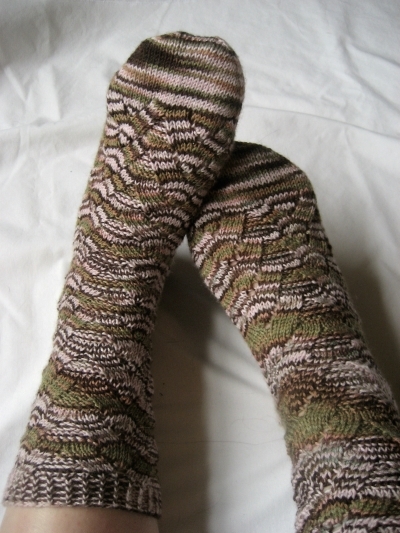 Did I mention these are my first socks to finish up…ever?? I love them, am wearing them right now. 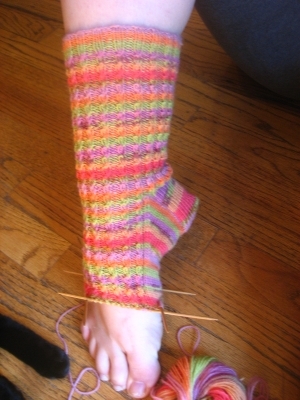 I think I could become a sock knitting addict. Seriously. Here you can see my beautiful short rows and rounded toe. LOVE! Mods: I added short rows to this top to accommodate my bust. When I hit mid-bust, I added 12 total short rows by repeating 6 short rows at a time. Since I knit this in the round, I wrapped and turned using the Japanese method, for 6 rows, then came back and picked up all the wrapped stitches by knitting one complete round, then started another section of short rows. I also added one round of purl stitches to make it easier to fold over the top for the elastic band. The straps were added because I need to wear a bra, so I picked up 6 stitches where my bra would be, and knit the straps in k1p1 sequence. My mom helped me sew the straps to the back as well as sewing in the elastic. Overall, I’m happy with this knit. It fits me well, and the straps perfectly cover my bra straps. I learned how to knit short rows, and although its not perfect in Lelah (I had some small holes), I know I’ll need short rows often to alter patterns to fit my bust, and I think with practice it’ll be invisible. 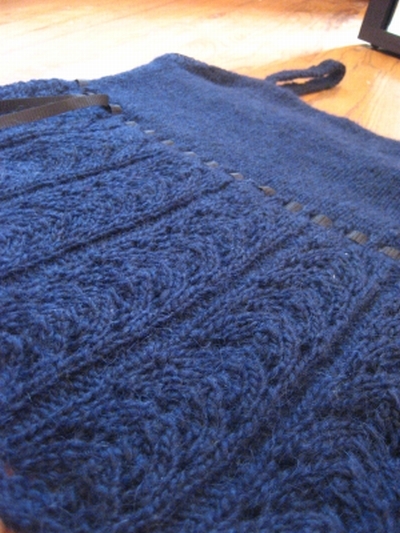 So I’ve decided to go ahead and RIP back the sleeves that I was working on for the Tangled Yoke Cardigan. I really want long sleeves on that one, so I’ve suppressed the desire to continue knitting on the sleeves I already have and have cast on for narrower ones. What I decided to so is to cast on fewer stitches, but increase more often throughout. 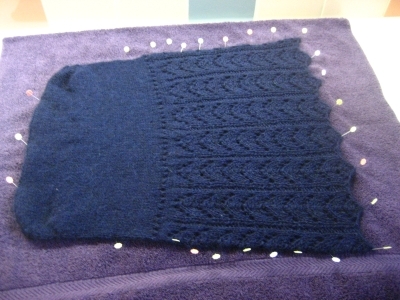 I’m a bit worried that this might make the sleeves wide up top, so what I might do it cast on the number of stitches stated in the pattern onto smaller needles and work a few inches or so to see if that fits the same. if so, smaller needles it is. I’ve also made some progress on the Baby Cable Rib Socks. First socks ever, so I’ve had some growing pains with them. I think I’m going to work the second sock toe up to see which method I prefer. Eventually I will probably work socks on magic loop. The sock is slightly big, but I think I’m going to give them to my mom anyway as she really loves the colorway. I detest it, and only realized this after I started knitting with it. Even though I’m completely in love with bright colors, I’ve discovered that for my feet I like warm colors, like this. Anyway, here’s a pic of my progress so far.